Gold Crown Billiards opened its doors on December 2, 1978, occupying 2800 square feet of the brand new Colonial Plaza in Erie, PA. Colonial Plaza is centrally located at one of the busiest intersections in Erie within a small triangle-sized parcel bordered by Peach Street, Liberty Street, and West 38th Street. 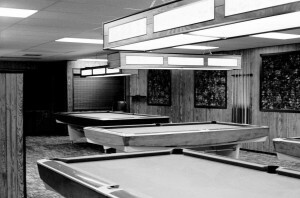 The space housed twelve 9-foot Gold Crowns, a few video games, and a modest selection of Adams Cues. The philosophy was to open an ultra-public establishment, making the wonderful game of pocket billiards available to everyone. 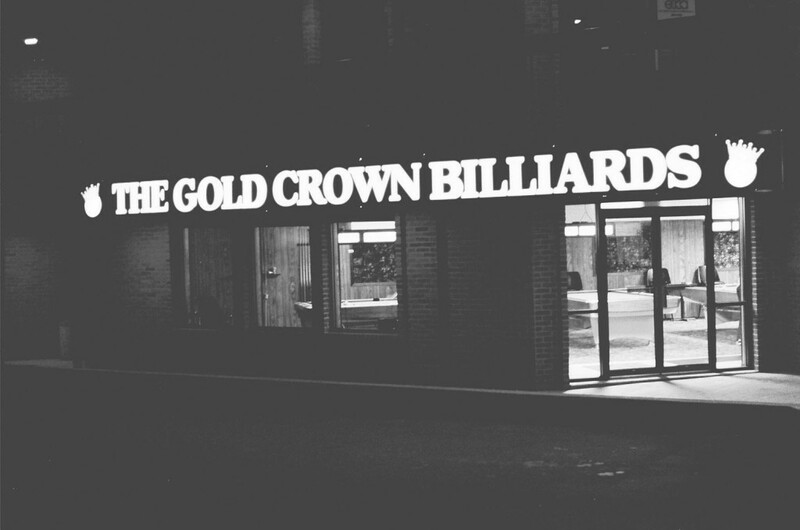 In those first few years, Gold Crown ran a partners handicap Nine-Ball league in the winter and a singles Nine-Ball league during the summer. Irving Crane performed a memorable exhibition in 1981 and Danny DiLiberto put on a nice show in 1982. Those early years saw many a top road player come walking through the doors: Earl Strickland, Bob Ogborn, Marvin Henderson, Bugs Rucker, Miami, and Patch-Eye, just to name a few. Gold Crown experienced three prosperous years but in 1982, it became increasingly evident, if the business was to survive, more concessions and revenue sources were needed. Plans were made for a bar/restaurant in an adjacent space for when it became available. Three very tough years for Gold Crown followed until 1985 and the existing tenant vacated the adjacent space, making room for Andy’s Pub. The new bar got its name from its first food service manager, Andrew DiVecchio. Drew only worked at Andy’s for less than a year but many of his recipes are still used today. On a side note, Drew moved to Las Vegas where he was Mike Tyson’s personal chef for many years. Gold Crown and Andy’s were now a hit. Pool, food, beer, wine and liquor combined to make a “natural”. The two businesses were an entertainment option that could compete with movie theatres, bowling, sporting events, and shows. The clientele expanded to include much more than pool players. The venue was perfect for gatherings, workplace tournaments, and all kinds of parties. 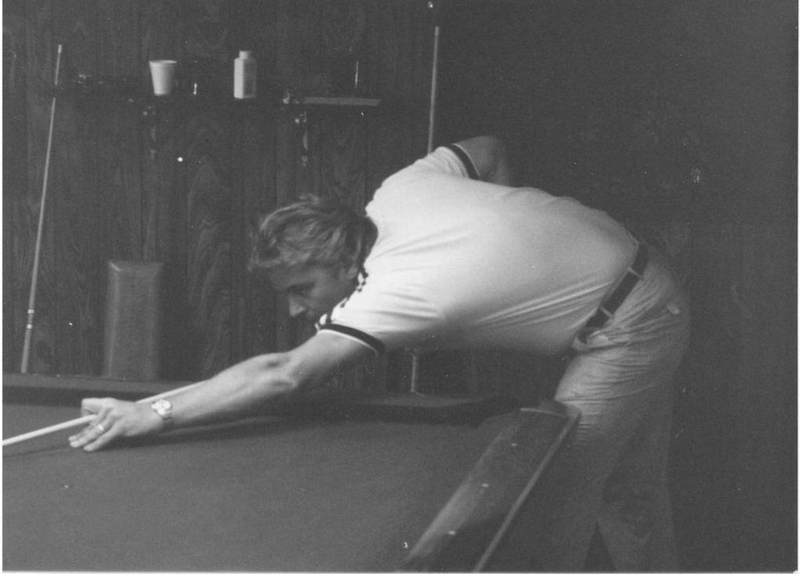 Steve Mizerak appeared for an exhibition in 1986 in which he played a game of straight-pool with local Julius Cottman followed by a dazzling performance of trick shots. Steve radiated confidence in his pool playing, addressing the media, and entertaining the customers. Steve loved food as much as he loved pool. At a dinner prior to his exhibition, Steve had to sample everyone’s entre. 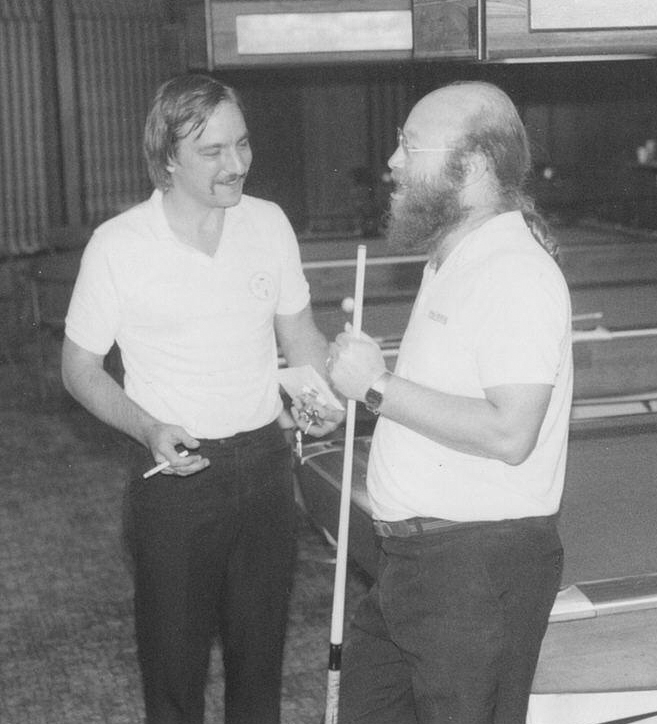 Two regional Nine-Ball tournaments were held at Gold Crown in 1986 and 1987, won by Howard Vickery of Columbus, OH and Pat Howie of Rochester NY respectively. There were few tournaments at that time for players to participate in. Both events drew around eighty players and were huge successes. 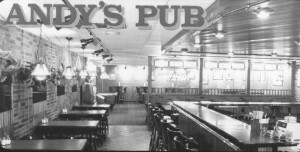 In the early 90‘s, Andy’s Pub became the first real “sports bar” in its area with countless televisions and a couple of large satellite dishes. Sports fans came from near and far to view games and events that they could not see at home and could not see at any other public establishment. 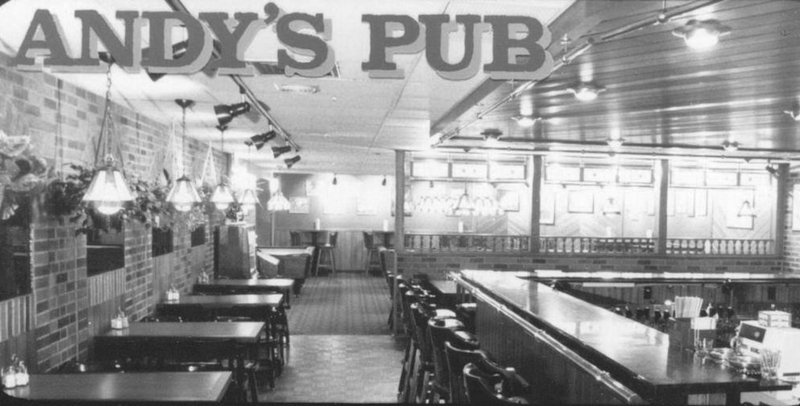 When the Steelers, Browns, or Bills were blacked out, Andy’s was jammed to the rafters. Business was brisk for the bar while Gold Crown was still basking in the glow of the movie “The Color of Money”. Teenagers and twenty-something cue twirling players filled the poolroom. By 1998, it was time to renovate and expand again. The shopping center was condominiumized and the opportunity arose for Andy’s and Gold Crown to purchase their section of the plaza, which they did. Andy’s and Gold Crown each doubled in square footage to a total of 10,000 square feet. The project took two years and changed the businesses forever. 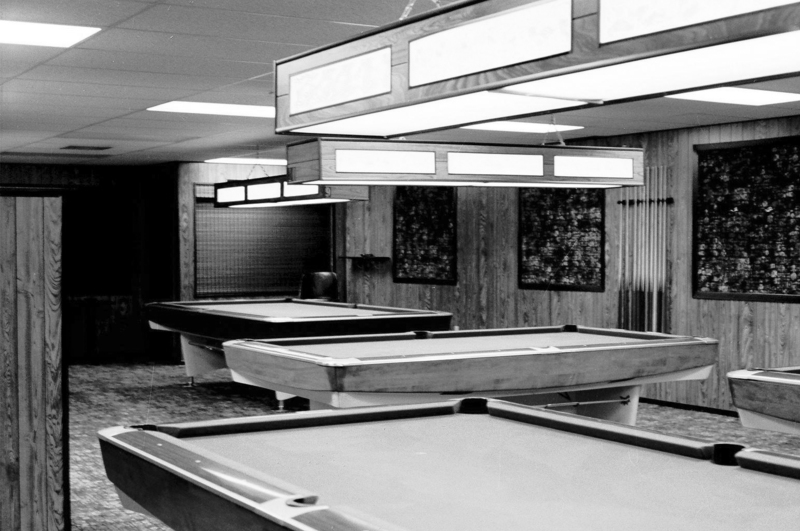 Gold Crown now had a total of 24 pool tables and Andy’s could serve 165 people. Televisions for viewing sports were everywhere. The Gold Crown became multi-level. The billiard room now had a sunken room with four tables, a balcony with three tables, a bar with four tables, an open main room with a high ceiling with eight tables, along with a front room with an additional five tables. A visit to Gold Crown and Andy’s became an event. In the year 2008, an opportunity presented itself to purchase the remainder of the plaza and expand again. The plaza exterior was renovated. A new bar would be designed, constructed, and named the Bullfrog Bar. The new bar would comfortably host live bands, corporate parties for up to 200 people, provide outdoor balcony seating for the Summer, and feature a 23 foot projection screen. The Bullfrog Bar became an instant hit. Gold Crown instituted a program in 2010 where 4 regional Nine-Ball tournaments called the Tri-State Open would be held every year. The events are very popular and draw players from Pennsylvania and surrounding states. Gold Crown, Andy’s Ale House & Grill, and Bullfrog Bar are a mega-plex and have become an institution in the City of Erie. They will continue to explore, create, and venture into new activities, recreation and entertainment, while providing casual dining. Even after 33 years, every new year brings with it a renewed level of enthusiasm. What’s next? Stay tuned! A crew of six, two bucket trucks and a crane, assemble a 45 foot, $125,000 sign and message center in 2010.